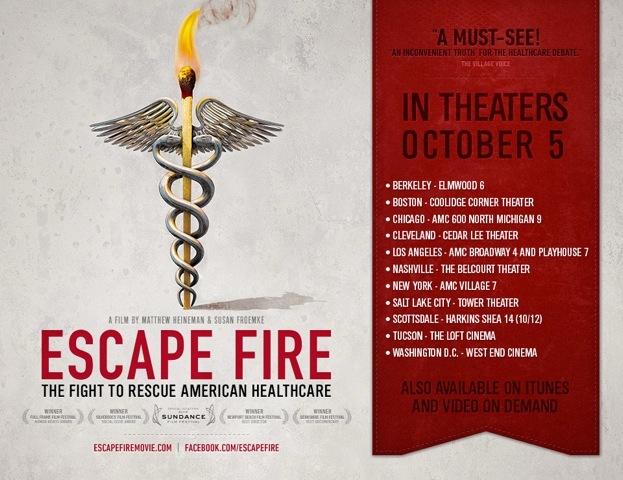 Escape Fire is a new documentary film that shines a strong steady light on the powerful dark matter of medicine. Personal stories of patients seeking care are interwoven with expert commentary from heads of government, insurance companies, doctors and journalists. While the call that US healthcare is broken seems old, the stories shown here are new, and uncover why it is broken and how it can heal. The stress points that are breaking seem to be about focusing on sick-care instead of health care. A heart surgeon exposes what he names “perverse economic incentives” that reward doctors for doing procedures, instead of rewarding them when patients become healthier. A former head of a health insurance company visits a US remote areal medical service – where people come from miles around to line up for free care in sheds and tents – and he has a crisis of conscience. A doctor shows research evidence that reducing stress reverses heart disease, and then forms teams of physicians, psychologists, nutritionists and yoga instructors to help patients heal. One patient in the ER for heart disease talks to the doctor about when he’ll change to a heart health diet. For him, it will be when he knows what’s wrong with him. Education about what causes leading chronic health problems is missing from our schools. And the movie Escape Fire points out that preventative care and nutrition education are also lacking in most doctors’ educations too. This new movie is not all gloom and doom, far from it. With a focus on healthy living, healthy foods, keeping active and reducing stress with yoga and meditation, the film makers give us a great big dose of hope. One patient portrait is of a veteran, Sgt Yates, who served in Afghanistan and returned with PTSD and back injuries, unable to walk. He is transformed from drug dependency, to health through meditation and acupuncture. He says, “I’m not changed, but I’m changing”. This movie made me want to change too, and take more responsibility for my own health. We needed health care reform, now we need a health care revolution, with each patient being part of the change. The website for the movie has a First Aid Kit at: http://www.escapefiremovie.com/first-aid-kit with tools to become part of a solution. Looking forward to seeing this movie. Focusing on health seems to be the element that’s missing in the U.S. medical system. Being healthy just isn’t profitable for drs. and drug and insurance companies. My hope is this movie receives the attention and recognition it should have and the impact it deserves. I believe you add credibility to the argument.